I'm almost done with the sewing bird on the needlework round robin. This picture was taken Thursday night, and since then I've completed all the cross stitch and am working on the backstitching. My plan is to finish it tonight and send it out tomorrow. I decided to put these two into one blog entry since they're in the middle of the same stuff they have been. On the Medieval Mandala, I got another color on the top half of the corner done, meaning I have only one blue to go on that part. Will be doing the gold next. On the Midi, I got a plant and a half done and and another pot. I might get this part done before I get to France. Stitching time is going out the window with preparations, spring, and everything else going on. I didn't have much wait time last week. That's why there is so little progress on this. The band I just started is at least as big as the flower and square band, and my hope is to finish it this week. Time keeps getting more and more squished on me. Does it ever slow down and let you catch up on your stitching? I hope it will for me soon. This week, I managed to do Part F. It's the calyx of the other flower, and I think I did the box couching better on it. At least, it looks better to me. I'm liking the progress when I get to work on this, but it's looking like I'm going to have to take this to France to complete. I really want it done, so I might take a week or a day or two and just work on it to catch up. This is Yveline's round robin - it arrived in the same package as my completed one. I need to add a calendula (marigold) to it for October. My daughter remarked on how appropriate that was because it's my birthday month. I have a picture of a calendula that I need to make a chart of. Will do that after I'm back home on Monday. I think her idea is lovely and it looks so pretty! My Round Robin Flew Home! I got a wonderful, beautiful surprise in the mail today. My round robin flew home! It's done! I love it, even if my husband says the contrast isn't great. I think he says that because it's hard to photograph. i'm just thrilled with how it turned out. There's a blank spot near the middle that I think I'm going to put everyone's initials in. Now I have to finish the other two that I have to go through. The needlework sampler one is almost done and the other I got in the mail with mine. I so recommend doing this! I got to use a color other than Honeydew this week -and the edges of the swirls are beginning to be more defined. I still like the detail of the garden - but it takes so long to do! This picture shows the first band almost done - another sailor needed to be added to the right side. It's done now and Band 2 is started and about halfway done - picture to be taken tonight, along with everything else. The backside doesn't look quite as nice as the front, mainly because of the starting and ending of threads, but it's still pretty reversible. My kids and husband think that's neat. I'm sure I won't get this all done in time for the review, but I'm going to turn in what I have done when it's time. My husband managed to take a better picture of the whole piece this week. As you can see, it's huge. My little sewing bird in the corner is dwarfed! It's coming along pretty well, though. Since taking this picture, I have the bird and the second cushion done. All I have to do now is the vise and the outlining and it's done. I was contacted by Muriel earlier this week and she's sending me, she says, the last two, very soon. Maybe I'll have mine back sooner than I thought. This week, I started a new part of the purse - I'm beading the edges. Talk about tedious! I have two rounds of it to go, and in the picture, when you look at it full size, I've got most of one side done. The instructions said to do it all in black beads, but I decided the foundation beads would be silver with black connector beads across them. So far, it looks good. I didn't get to make the strap any longer this week, though. Since taking the picture, I've both lengthened the strap some and edged the first round across most of the flap. I doubt I'll make more progress on it before the next picture, but at least it's coming along. I joined another round robin, and after I joined, I found out it had to be on Aida so ... I dug this kit out of my stash. It's a Mary Hickmott pattern and is of the nine planets, on 14 count black Aida. My husband will love it. I'm hoping people will each stitch one planet and I will do the other four. The first mailing date is June first, so I have quite a bit to do. This planet I'm starting is Mercury. Eventually, the stitching is nearly five feet across, but only eight inches from top to bottom. Still working on this first corner, but at least it's coming along. I've got quiet a bit of the top half of it done and should get the rest of the tip of the corner this week. Not sure how much I'll get done this week, though. Pictures will be taken a bit earlier than usual (Thursday night) and I'll be gone over the weekend ... on top of the usual kid taking around and such and meetings. Will be trying to get as much as possible done, though. Yes, I'm posting later than usual for a Sunday - I went to the Tut exhibit at the Franklin Institute in Philadelphia. Was okay, but not worth the cost because of the huge crowds around every single item. Couldn't see anything properly. Another gripe I had was that they implied the sarcophagus was there and it wasn't. There were several nice items, though. Needless to say, I haven't put a stitch in anything all day. To get back to stitching - you can see that I added some foliage this week and got another pot plus done. Will be doing more this week, of course. It's still progressing and I'm done with the green arches of doom. The Huswif's done through Part 1 (which ends just above the second line of letters) and I'm well on my way into Part 2. Part 4 comes out the first week of May, though, so I'll probably end up staying behind despite this being the carry-with project. The colors are growing on me and I'll make use of this when it's done. Parts C, D and E of the goldwork project completed the flower that's in close up here. I think it looks pretty good, but I did a couple of things wrong - instead of ending the couching every round on the lower leaf, I just kept going round with it. That led to some bumpiness. When I did it properly on the upper leaf, I left some gaps in the leaf on the wider parts. I really need practice! Hopefully I'll get some and some in person instruction, which I feel necessary, at the ANG seminar in Baltimore in August. Now on to part F! It seems the dominant color of Part 2 is "Honeydew" Waterlilies. I've been getting to see it a lot. It's the light greenish background in these pictures. From what I heard from others, this part takes about forty hours to stitch, so I'll be on it a long time, probably until I go to France (hard to sink in, but only five weeks now). At first I didn't like the color, but it's growing on me. Progress is very visible too, which is always good for me. I'm so behind! I think this is due in two months and I'm just starting it. It's a relatively new correspondence course called Tiramisu and I'm taking it through the Cyberstitchers Chapter of the EGA. I've decided to try out the soy luster, since I was given some as a gift. The color shown in this picture is Egyptian Lapis. I'll be using a Needle Necessities overdyed, too. Fabric is 32 count Meditation from Picture This Plus. Hopefully, it'll all mesh together well. The floss toss looks good, and the stitching is turning out okay, even if I did have to rip out the beginning of the second sea monster - I put it two stitches too far from the first. That's done now and the first band is actually almost done! 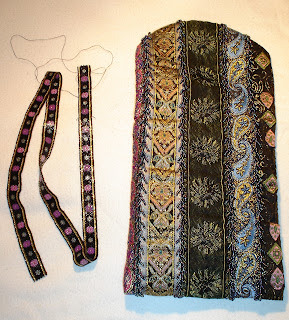 The piece is all reversible blackwork. I'm not having too much trouble with it yet, but I haven't used the overdyed yet. The sewing bird is beginning to look like a bird now. It's going according to schedule. I'm definitely mailing this out before I go to France, most likely in about three weeks. Hopefully I'll have the next one by then and be able to take it to France with me. This piece, by the way, is HUGE. It's about 25x30 inches. It'll look stunning when it's framed. The strap is now officially 32 inches ... only 11 inches to go. I started doing the beadwork this week around the edge of the bag, but that was after this picture was taken, so you have to wait until next week to see it. The beading along the edges is rather tedious, but I'm sure it'll look nice. The end is in sight. All I have to do after the strap is finish the edging, make another circle for the rose, and put the rose together. It seems Missy the cat wants to learn blackwork pretty badly. She does this kind of often ... gets on the needlework when it's being photographed. At least she doesn't get on it at other times. Tux, her brother, likes to knock over the goldwork and sit on it. I've discouraged both. The corner is getting there ... I really like the colors, though I've decided I don't like the feel of NPI as much as I do Vikki Clayton's. There's a small part on the outer corner in this picture that needed frogging ... which is done now. This part is going to take a loooong time because there are four corners with this much stitching on them! Perhaps I'll get some caught up on rainy days in France. The part of Normandy we're in is known for a lot of rain, and no drought there like southern England. I really like working on this project more than I do the Midi, and I'm convinced it's partially the color of the background fabric. This light blue looks very good with the silks so far. There are still several colors I haven't used yet. Perhaps they're for the houses around the outer edge. Well, I got two more pots nearly done. It's going and the progress is more visible than on those arches, but sometimes I feel like I'll never get this done. Nine and a half months after the beginning of the chart and I'm still only on the second of six parts! I can only hope the other parts have less stitching in them. I -think- they do. If I knew what the design looked like when I started it, I wouldn't have put it on such a dark fabric. It looks okay, but just doesn't grab me as a good background now. I must have the mid-project doldrums. The rain and snow through yesterday didn't help that, I'm sure. I've made quite a bit of progress on this, mainly because it's become the piece I carry around while waiting for people to get done with things. The colors on the second picture are more true; it's hard to get a good picture because of the lack of contrast between the fabric and the floss. I still love the feel of Vikki Clayton's silks. After this picture was taken, I finished Part 1 and started Part 2. Part one ends at the bar below the frames. So now I'm only a month and a half behind. Got this finished this week. I'm going to put it into a luggage tag as a gift when I get the tag. It's the ninth of ten finishes on my project challenge. Only one more to go! 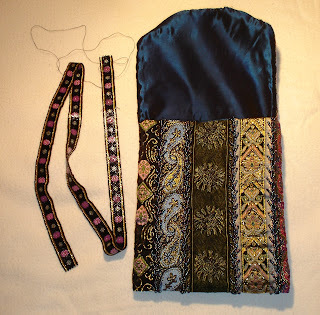 This week I was able to work on the goldwork twice, making me able to complete two areas. The "beads" in the middle of the flower were all supposed to use Jaceron, but I had extra bits from my last goldwork piece and used them. That means I added bits of copper to it. I think it looks pretty good. I reached the point of the edge of parts 2 and 3 this week. I'll be working it from top down now. Since taking this picture, I've made more progress than usual for me in a week. I'm pleased. The colors blend into each other quite well. I'm still far behind, but at least I'm catching up, somewhat. I didn't get much done on this this week - just managed to get the strap another inch and a half longer. I still like how it is coming along. Will be able to get it done, hopefully, soon. I have the heart completely done now and am just filling in the background now. It looks pretty good and I got quite a bit more done since this picture, so I -should- have this done by the end of the week. It's my goal! Still working on the first corner, though it is coming along. Got most of the colors for the triangle in there, at least, though it needs gold in it. My husband left again today for another two week trip, and I'm here with two kids, a dog, two cats and a guinea pig. My stitching has really been suffering with this whole upset schedule thing every week. Maybe when I get back from France I'll settle into a new schedule. I doubt it'll happen before then. I got two more plants done on the pots and progressed a little more on the terra cotta. Once I finish them, I have a lot of Rhodes stitches to do, but they go a lot faster than the cross stitching sometimes. Some of you may remember this piece of stitching - I finished it around Christmas. My husband completed the frame and assembled it today. Didn't he do a great job? I really like it, but it's going to my best friend's mother, who collects pandas. I hope she enjoys it. Won't know until Memorial Day weekend, when she goes to visit her son and pick it up. I got through Band D done this week, and this morning, after last night's picture but before I posted, I managed to get a good dent in the rather large Band E. Maybe I'll catch up. One day. This picture is closer to the true colors and not as yellow as last week. So far, the stitching, when I've done it, has been pretty easy. I spent a large chunk of my stitching time this week filling in the one space on this flower. I think I did a decent job of it, even though I didn't do it the way the directions said. I really need to read them more carefully next time. The two petals flanking this one are next, and they too will be completely filled - but with a different kind of thread to be couched. 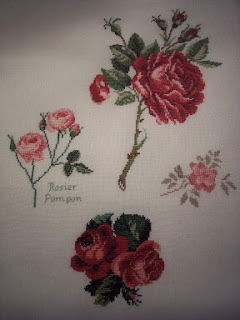 This afternoon I finished the last stitches of the rose round robin. As you can see, my husband took a picture of my part in close up and two pictures of the overall large piece. I'll be mailing this out tomorrow. I think it came out pretty well, and this also means I've completed eight projects of my ten project challenge. 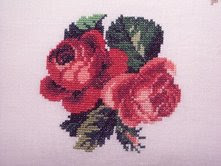 Now tomorrow I can start working on the needlework tools one, since Lynn's pattern came today (yay, thank you!). Hopefully that one will go a little faster. It's looking like a real purse now. I got the second side sewn up. Didn't make any progress on the strap, though. Should be able to report progress on that next posting on this. With every step done, it's looking prettier. My husband keeps saying, "Are you sure you want to give this to our daughter?" I promised it to her, so she'll be getting it. Next step on the purse itself is beading all the edges in black.